Kitsap Transit is a public transportation agency, based in Bremerton, Washington and serving the county of Kitsap, which operates routed bus service, foot ferry service and service for elderly and disabled passengers. The agency has long been concerned with preventing engine failures and optimizing maintenance schedules for its fleet of approximately 362 pieces of equipment including transit buses, cutaway small buses, vans and three passenger only ferries. Previously, the maintenance department monitored the engines of vehicles in its fleet by sending oil samples to an outside laboratory. The analyses provided measurements of heavy metal content, fuel and radiator fluid contamination, etc. The problems with this approach were cost and time: it cost $40 per sample using a third party lab, and it took 14 to 21 days to receive the results. 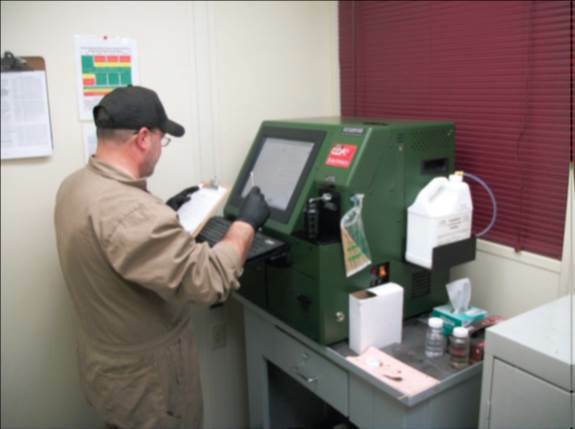 The cost limited the number of samples that were analyzed and the lead time created the possibility that a failure might occur before the results were received. for less than $1 per sample in less than 15 minutes.